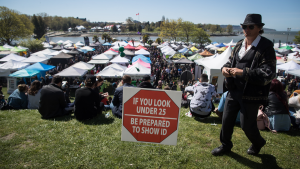 Nearly a hundred participants stepped up for a good cause in downtown Vancouver. Nearly a hundred participants stepped up for a good cause in downtown Vancouver Sunday morning. Runners and walkers descended upon seven skyscrapers in order to climb them, asending 6000 feet to help fight prostate cancer. 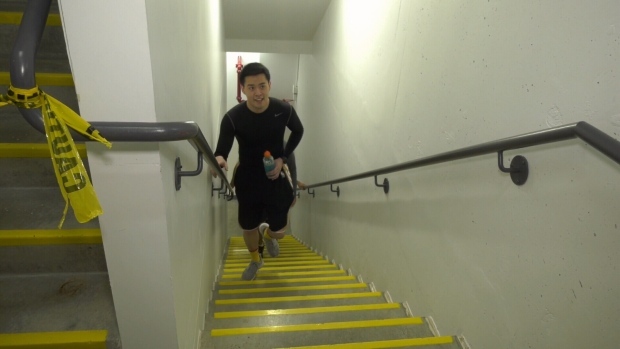 The participants climbed over 390 floors of stairs, as the ultimate leg day workout. “It really pales in comparison to what men and their families go through when diagnosed with prostate cancer,” said Mark Mahl with Prostate Cancer Canada. CTV Morning Live host Keri Adams also laced up for the challenge. "Apparently it’s a very strenuous workout. I don’t know if I can do all the buildings. But I’ll give it my best," she said before the gruelling climb. All the members ran or walked the stairs of Vancouver’s MNP Tower, Guinness Tower, Bentall Centre One, Oceanic Plaza, Waterfront Centre, Bentall Centre Four and Harbour Centre. And some even did the challenge twice. This is the 6th year Step Up Challenge, which raises raising awareness and funds for prostate cancer research in Canada. The fundraising goal this year is $75,000. Donations can be made here. CTV Morning Live Host Keri Adams participated in the Step Up challenge.